Caregiving is an important part of a senior’s quality of life, especially if they have a chronic condition such as Alzheimer’s, Parkinson’s, and COPD or had a Stroke. A professional caregiver can also provide additional support for the family, providing the much needed respite care. Since the company’s founding in 1990, Granny NANNIES has recruited some of the most professional and dedicated Certified Nursing Assistants/Home Health Aides in the area. Eligibility Verification to work in United States either as U.S Citizen or Foreign Citizens who have the necessary authorizations. 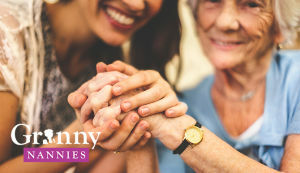 For nearly 30 years, Granny NANNIES has referred professional care providers who have brought compassion, comfort and expert care to clients who are able to remain at home while surrounded by the people and things they love. If you or a loved one are in need of assistance with activities of daily living or help in monitoring other health concerns, CNAs and HHAs are available 24 hours a day, seven days a week for all ages and levels of care. Granny NANNIES believes in treating clients with the highest level of respect and dignity and maintains the commitment to excellence that it was founded upon in 1990. For quality, trustworthy, reliable and affordable care, Granny NANNIES is there.